The Art of Political Cartooning | Kid Reporters' Notebook | Scholastic Inc.
Maxwell with political cartoonist Matt Wuerker. On November 15, Wuerker hosted a cartooning workshop at the Lyndon B. Johnson Department of Education in Washington, D.C. The program was part of Art.Write.Now, a year-long showcase of the best teen work from the Scholastic Art & Writing Awards. The audience for political cartoons has grown in recent years with the use of cell phones and mobile tablets. Cartoonists can cross linguistic lines and even reach people who don’t read fluently. Wuerker creates three cartoons each week, which appear on the back page of Politico, a news publication. He has no editorial restrictions except for a copy editor who checks spelling. Maxwell with fellow award-winning student writers and artists in Washington, D.C.
Wuerker uses pen and ink and watercolor for his cartoons. He likes adding crosshatching and shadows. Many other cartoonists use simple lines and digital art. They may even work with animation. 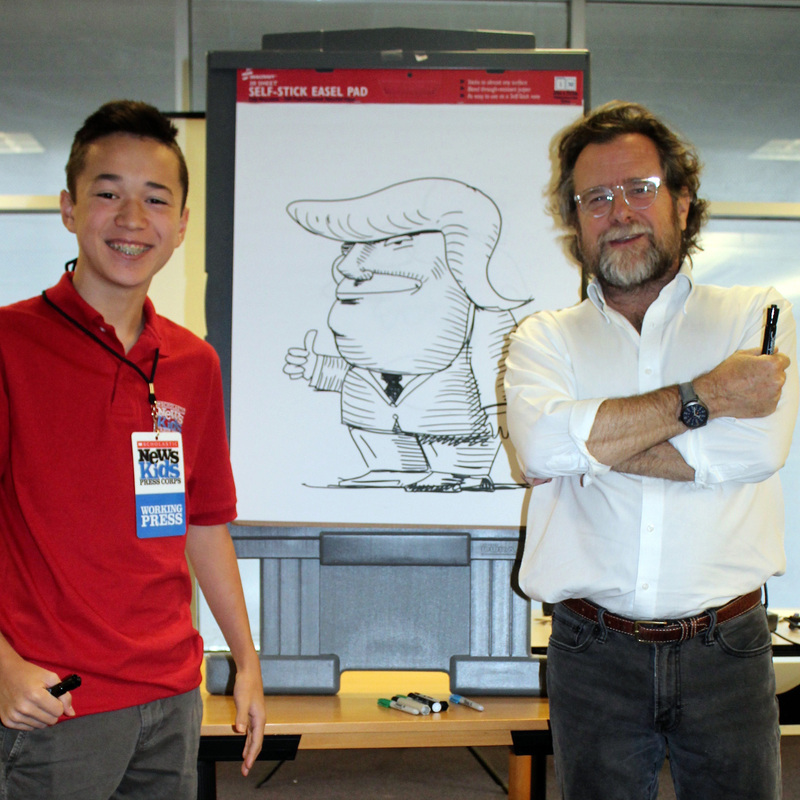 During the workshop, Wuerker gave a step-by-step demonstration to students on how to draw caricatures of President Donald Trump and former President Barack Obama. A caricature is a loaded portrait because it exaggerates a person’s prominent features. For example, Obama has a big smile, while Trump has wavy hair.